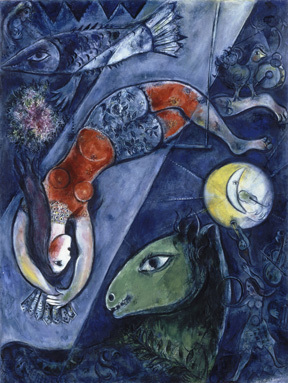 (TORONTO – Jan. 20, 2012) The exhibition that brought the magic, whimsy and wonder of Marc Chagall and other visionaries of Russian modernism to the Art Gallery of Ontario drew 152,637 visitors during its 13-week run, ranking as the eighth best-attended exhibition in the AGO’s history. Hailed by the Toronto Star as “a story of colour, motion and mystery” and by CBC News as a “rare treat,” Chagall and the Russian Avant-Garde: Masterpieces from the Collection of the Centre Pompidou, Paris was on view at the AGO from Oct. 15, 2011 to Jan. 15, 2012. Over the course of the exhibition, the AGO acquired 6,850 new members. Strong membership renewals driven by visitor engagement with Chagall and the Russian Avant-Garde, as well as last summer’s blockbuster Abstract Expressionist New York: Masterpieces from The Museum of Modern Art, have set the stage for the Gallery to achieve an all-time high of more than 78,000 members by the end of the fiscal year. AGO events related to Chagall and the Russian Avant-Garde had a total attendance of 1,162, including 375 party-goers who attended the sold-out Chagall Ball in October. More than 600 diners enjoyed a special three-course prix fixe dinner package at FRANK, designed by executive chef Anne Yarymowich to celebrate French and Russian cuisines. Retail sales at shopAGO were also strong, with Chagall-themed books, stationery and gifts proving popular with visitors. Organized by the Centre Pompidou and curated by Angela Lampe, the exhibition examined how Chagall’s Russian heritage influenced and informed his artistic practice, illustrating both his embrace and rejection of broader movements in art history as he developed his widely beloved style. Chagall and the Russian Avant-Garde comprised 118 works in a broad array of media by artists including Wassily Kandinsky, Kasimir Malevich, Natalia Goncharova and Sonia Delaunay. The closing of Chagall and the Russian Avant-Garde: Masterpieces from the Collection of the Centre Pompidou, Paris paves the way for the upcoming blockbuster Picasso: Masterpieces from the Musée National Picasso, Paris, opening on May 1, 2012, and featuring more than 150 highlights from the Musée’s unparalleled collection. The AGO recently announced this fall’s major exhibition, Frida & Diego: Passion, Politics and Painting, featuring 75 key works by iconic Mexican painters Frida Kahlo and Diego Rivera, opening Oct. 20, 2012. AGO members view both upcoming exhibitions for free. More information on the benefits of membership can be found at www.ago.net/general-membership. The Art Gallery of Ontario gratefully acknowledges the Lead Sponsor of the Chagall and the Russian Avant-Garde: Masterpieces from the Collection of the Centre Pompidou, Paris, Sun Life Financial, and the special support provided by Joe and Budgie Frieberg, with additional generous support from Nance Gelber & Daniel Bjarnason, Leslie & Anna Dan, Wendy & Elliott Eisen, Al & Malka Green, Samuel & Esther Sarick, Dorothy Shoichet, Marion & Gerald Soloway and the Government of Ontario. With a permanent collection of more than 80,000 works of art, the Art Gallery of Ontario is among the most distinguished art museums in North America. In 2008, complete with a stunning new design by world-renowned architect Frank Gehry, the AGO opened its doors to the public amid international acclaim. Architectural highlights include Galleria Italia, a gleaming showcase made of wood and glass running the length of an entire city block along the Gallery’s façade; and the feature staircase, spiralling up through the roof of Walker Court and into the new contemporary galleries above. From the extensive Group of Seven collection to the dramatic African art gallery and from the cutting-edge works in the contemporary tower to Peter Paul Rubens’ masterpiece The Massacre of The Innocents, a highlight of the celebrated Thomson Collection, there is truly something for everyone at the AGO.